I am excited for all the fun things will get to do and having a bit of time off work. Dreading that I need to still get K's blanket done and having to shop in the stores. I hate the way people behave during this time of year. Christmas should not be about racking up debt on your credit cards and shopping. Just go into a store and see how rude people are. It makes me sick! I don't hit snooze but lay in bed for five minutes to listen to news on radio. Yes, the majority of my kids clothes and most of mine come from Thrift stores, unless can't find something (like pants for N as he gets older, shoes) or if get really good deals new. J will not go shopping in thrift store though for clothes so most of his stuff is new from Mark's Work Wearhouse, and even then I have hard time getting him to try stuff on so that is why I buy from one place for him and just know his size, plus they have awesome sales. Although I did get him into change room at Value Village to buy our halloween costumes. Stopping by from MMOM! Have a great day! I am a new visitor and follower from MMOM. Hearing loss is so said I have a grandson who has had many surgeries on his ears. The positive side is we all know sign language! Thanks for playing along with Meet Me on Monday!! 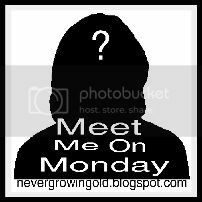 Please remember to link the url only of your Meet Me On Monday post and not your whole blog! I have to go in and fix it! !